July | 2011 | What about this? Grumble, grunt, slump, cobbler, crisp, and brown betty . . . oh my! Without a doubt, juicy summer berries tempted more shoppers than the peach, their summertime rival, at last week’s outing to a farmer’s market. 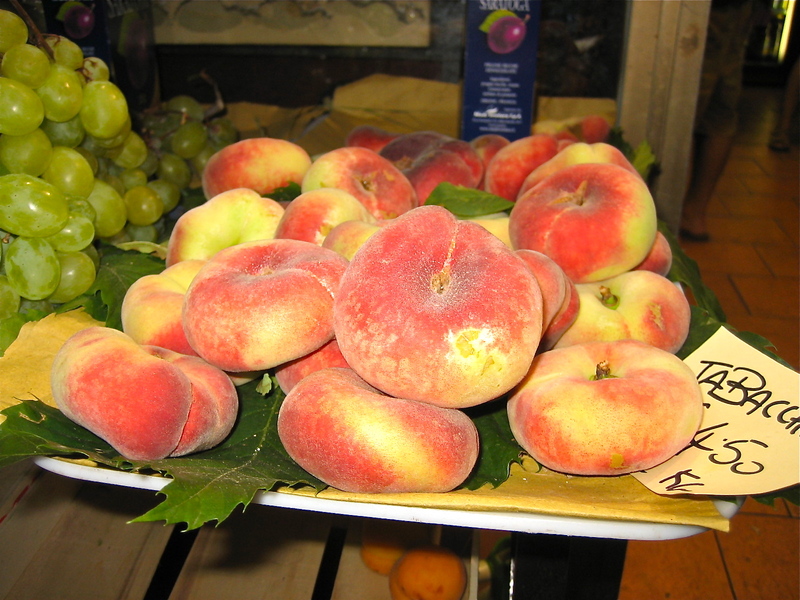 With high nutrient and fiber levels, who could ignore these sweet gems of summer. I couldn’t! After purchasing three pints of blackberries and three pints of yellow and red raspberries, the only thing harder than trying not to eat them on the drive home was trying to decide what to make with them. My husband’s East Coast origins cried out for me to make a grumble, grunt, slump, cobbler or crisp, but never having made a brown betty before, I wanted to try making one. With its origin dating back to colonial days, a traditional and popular brown betty is made of alternating layers of buttered crumbs (bread or graham crackers) and layers of sweetened and spiced apples. That sounds perfectly delicious, but after reading Martha Stewart’s recipe for Berry Brown Betty, with its two types of raspberries and brioche breadcrumbs, this recipe won hands down. Who could resist the rich butter and egg flavor of brioche combined with fresh-picked berries? Not me! 1. Preheat oven to 375 degrees. In a medium bowl, mix all but 1/4 cup berries with lemon juice, and set aside to macerate. Brush four 6-ounce ramekins with 1 tablespoon butter; coat inside of each with granulated sugar, and set aside. 2. In a small bowl, combine breadcrumbs with remaining 4 tablespoons butter, and set aside. Sprinkle the brown sugar, flour, and nutmeg over raspberries, and gently toss to combine. Divide one-third of breadcrumbs evenly among ramekins. Top with half the berries, and then with another third of breadcrumbs. Repeat with remaining berries and breadcrumbs. Gently press down on layers. 3. Bake until the crumbs are golden and berry juices are bubbling, about 20 minutes. Remove from oven, and let cool 5 minutes. 4. Invert ramekins onto serving plates. 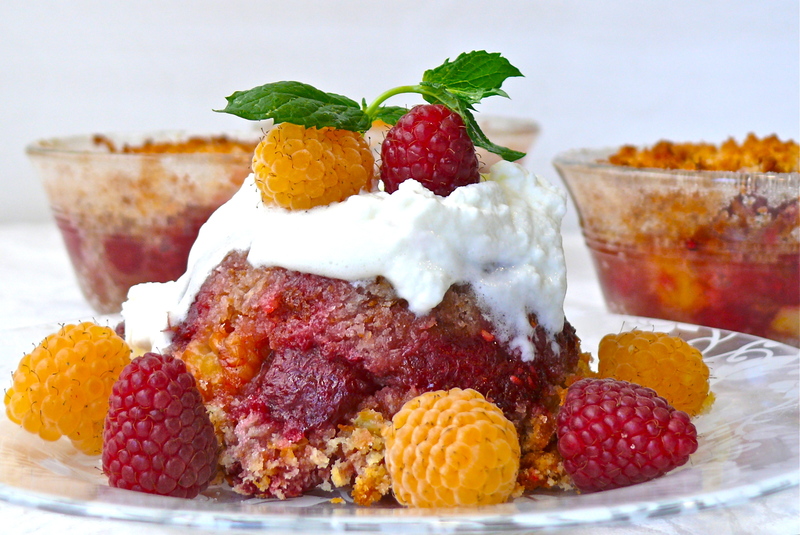 Remove ramekins, and top each dessert with whipped cream; garnish with reserved berries. 1. I purchased fresh brioche rolls at Whole Foods and made breadcrumbs out of them using my food processor. 2. Taste your berries before adding the sugar. If they are deliciously sweet, you will not need to add all the sugar specified. If they are not as sweet as you’d like them to be, you may need to add more sugar than specified. 3. It required more than one tablespoon of sugar to coat all four ramekins. 4. Although not necessary, I combined the brown sugar, flour and nutmeg in a bowl before sprinkling them over the berries. Doing this allowed for more even distribution of the dry ingredients. 5. I needed more buttered brioche breadcrumbs than the recipe specified – probably because I’m not good at estimating amounts! Enjoy this simple summer dessert! 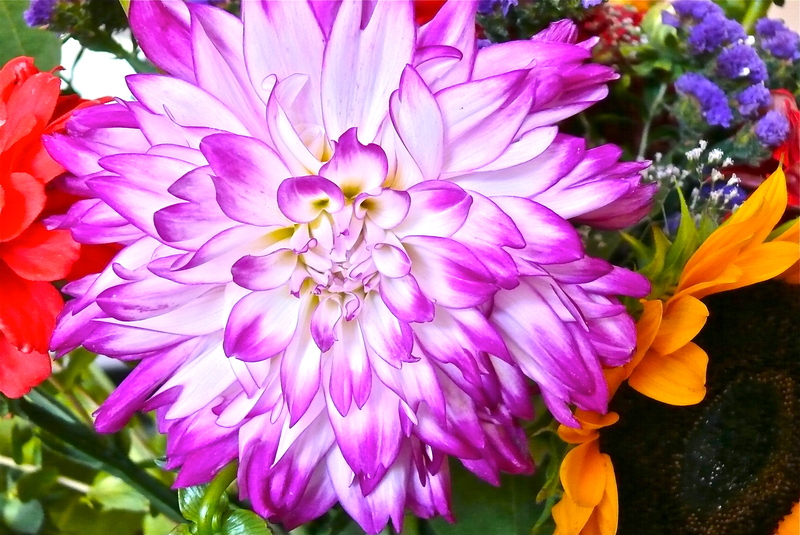 From afar their sheer beauty captivates, but up close flowers demand admiration. Flowers bring me joy. I’m drawn to them wherever I go and I can never walk past one without appreciating its loveliness. Is it the eye-catching color that begs me to stop? Is it the geometric perfection that makes me pause for closer inspection? Is it the velvety-softness of the petals that my hands want to touch? Or does the essence of its perfume send signals to me? It’s all of the above and more. I’m rarely without my camera, for I never want to miss an opportunity to capture beauty! Plants are not only beautiful and decorative, but they can also improve the air in your home. Thanks to NASA research, here is a list of common household plants that remove pollutants and harmful gases from rooms inside your home or office space. Click on the link to read full descriptions of the plants and their care. For the love of Everlasting Gobstoppers – this year marks the 40th anniversary of the original Willy Wonka movie! Watching this movie and singing Umpa Lumpa songs with my kids always made for a fun evening. Thought I’d do well on this Willy Wonka Trivia Quiz, but not so! Either I didn’t drink enough Fizzy Lifting Drink or it’s been way too long since I sat down with the kids to watch the movie! View treasures from the National Archives, which include Victorian fashions, the Magna Carta, and documents from the Titanic, and maybe learn something you didn’t know before. 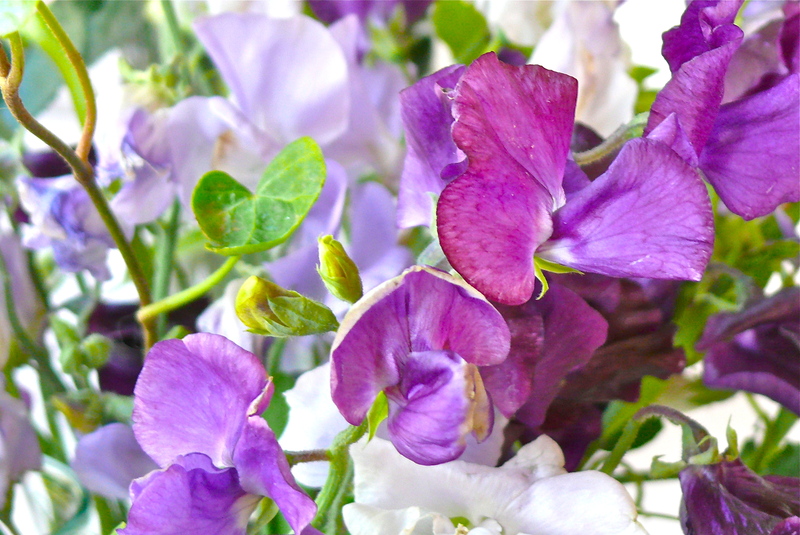 Stop to smell the flowers this weekend! Forrest Gump’s mama always said, “Life is like a box of chocolates,” but the older I become, the more this mom views life as a series of never-ending staircases, much like those drawn by M.C. Escher. At particular phases in life, we climb metaphoric stairs and reach the top, only to find that another level exists and another staircase awaits. We learn the rules of the game during each ascent, but discover the game changes at every level. Parenting is a good example of my analogy: you start with a sweet, little baby, but no sooner do you get a grip on exhausting infant-ways, then your baby walks, talks, and throws tantrums. Mastering potty-training raises cheers and exultations, but creates a degree of independence, which allows your child to leave the safe haven of your arms to go to school. After years of navigating through playground dramas and class projects, you warily enter the hormonally-charged world of adolescence. By the time you regain some balance after the “driving” years, your child moves on to college applications. And before you can decipher the FAFSA form, your child graduates from college and finds a job. Recently, my youngest child and her friends reached a new level by graduating from college. 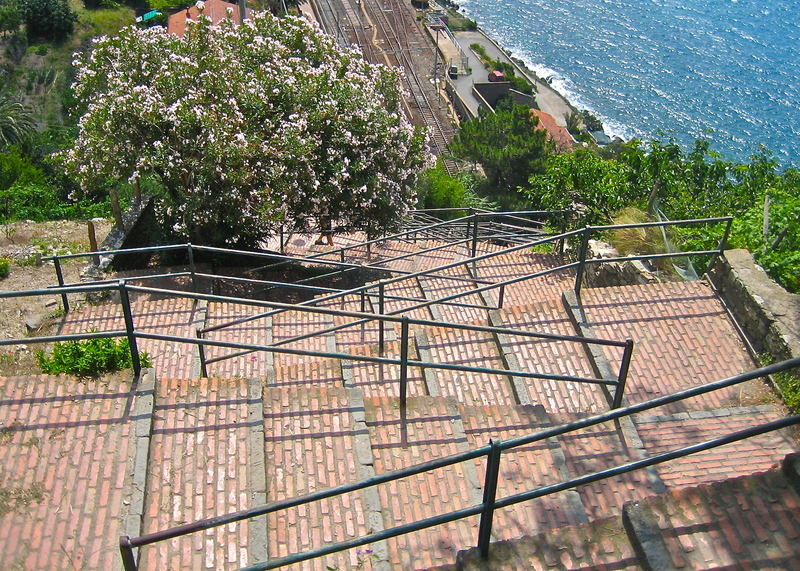 With high hopes they look to the future with new sets of goals and new sets of stairs to climb. For some of them, their staircases are straight forward – graduate school. For others, the staircases are long and narrow – medical school. But for many of them, their staircases rise, twist, and turn – the path of uncertainty. In the past, a college degree usually led to a job. Not so anymore. For those looking for jobs, the ascent is made more difficult by an extraordinarily bad job market. Looking for an energetic, detail-oriented person. Check! Must be organized and able to multi-task. Check! Must be a self-starter and be willing to work long hours. Check! Must be proficient in Word, Excel, and Power Point. Check! Must have the ability to work quickly under tight deadlines. Check! Must have a 4-year college degree. Check! Must have nonprofit experience. Check! Must have at least five years of work experience. No! With so many bright, intelligent, and experienced competitors for so few positions, employers have a gourmet assortment to choose from. If all employers hire experienced workers, who will give the inexperienced the experience they need? I will never forget the dentist who hired an energetic, young dental hygienist fresh out of school. I am eternally grateful to him for believing in me enough to take a chance on me. Hopefully, there are other employers out there who can remember what it was like to get their first job and their first vote of confidence, and who are willing to consider vitality and eagerness over experience. My daughter, her friends, and other recent college graduates will need patience and this kind of help to get to the next level. Landing that first job, of course, puts them at the bottom all over again! One of the most wonderful things about summer is the variety and availability of delectable summer produce. Every year at this time, I utter superlatives by the bushel and go on sensory overload. Peeling the skin off of a juicy, tree-ripened peach or taking an indescribable bite of a summer tomato topped with freshly-picked basil, just makes me happy. Could life get any better? Can’t find the end of a roll of plastic wrap? Use a piece of tape to find and pull up the edge. I learned that little tip from an article called, Extraordinary Uses for 16 Ordinary Household Items. Discover uses for toothpaste, nail polish, hair dryers, cornstarch, coffee filters and more! We live in an incredible world. Here’s a collection of twenty-seven photographs of our world that only photographers from National Geographic could capture! Can you win it, not in a minute, but in 5 minutes? That’s the challenge of Obechi, a computer game. The game involves capturing a set amount of moving dots in a set amount of rings. Unfortunately, you must sit through a brief ad before you play, but use that time to loosen up your fingers and focus your brain! During these warm summer days, light and refreshing salads appeal to those who want to fit into their swim suits and also get out of the hot kitchen. Myself included! Recently, I had a craving for chicken salad, but with outdoor temperatures soaring into the triple digits, my stomach churned at the very thought of a mayonnaise or sour cream-based salad. Searching for a light, but flavorful chicken salad, I hit the jackpot when I saw Mark Bittman’s recipe for Chicken Salad with Vietnamese Seasonings. The fresh flavors of lime, cilantro, and mint are well-juxtaposed against the saltiness of nam pla and the kick of chili pepper. 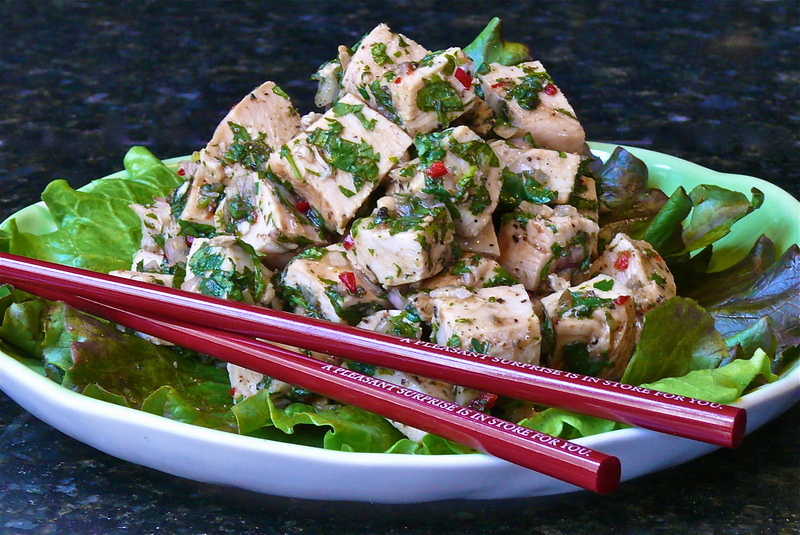 Although you can reduce the amount of cilantro and mint, you still need to be a fan of them to enjoy the salad. Grilling the chicken breasts outdoors eliminated heating up my kitchen. If you want to stay cool, drive in your air-conditioned car to an air-conditioned grocery store and buy a rotisserie chicken! This easy and flavorful salad would also be delicious in a lettuce wrap or a bread wrap. 1. Combine the first 7 ingredients in a bowl and toss with the chicken; set a bit of the herb aside for garnish, then stir the rest into the mixture. Taste and adjust the seasoning, adding salt if necessary. 2. Arrange the lettuce on 4 plates and top each leaf with a portion of chicken salad. Garnish with the remaining herb and serve. 1. Nam pla is a fish sauce that is one of the basic ingredients in Thai cooking. Fish sauce, in general, is used in a lot of Southeast Asian recipes and can be purchased in Asian grocery stores, specialty markets, and some general grocery stores. 2. I added no salt. The nam pla I used was plenty salty. 3. Having no Thai chilies on hand, I used 1/2 teaspoon of finely minced red jalapeno. The heat level of this dish can be easily adjusted by adding more or less chilies. 4. Rau ram (Vietnamese coriander) is the Asian herb of choice for this recipe, but it can be hard to find. I followed Mr. Bittman’s suggestion and used cilantro and mint with success, but the minute I find some rau ram, I’m going to make this salad using it and compare the flavor! Life is meant to be shared. This phrase sounds clichéd, but what would life be like if we could not share our highs and lows with others? “Sharing and encouraging joy in life” is the tagline for What About This? and is the intent behind every post written. Sharing ideas and thoughts that are helpful, inspiring, creative, entertaining, and sometimes thought-provoking has always been the goal of this blog. All of this sharing comes from a middle child, who always carefully guarded her possessions (that’s another story), but who now knows that life wouldn’t have meaning if she didn’t share. I’ve added All for Good to my Google home page, so I can see what volunteer opportunities are available to me on a daily basis. #2 – Which Is Worse? Fast food is not known for being healthy, but some fast food menu items are worse than others. Go through the short “Battle of the Fast Food Breakfasts” slide show to see how well you can recognize unhealthy food! Tired of throwing away lipstick tubes that still have lipstick in the bottom portion? Do you use a lip brush to get out every last bit? Have you found your perfect color is actually a combination of two lipsticks? My neighbor introduced me to a product called LipStix ReMix that conveniently solves these issues. By scraping out the bottom of two “used up” tubes and “cannibalizing” a partial tube of a “too bright” color, I created a whole new tube of lipstick using the kit. Not only did I save money by using lipstick that would normally be thrown away, I also created a fabulous new color by blending two shades. Plus, I even reused one of the original plastic cases to hold my newly created lipstick! Unlike pretty photographs, conceptual photographs make you lean in for a closer look and, more often than not, make you think. Check out this collection called 30 Amazing Conceptual Photographs. Find and spread joy this weekend! Rereading these words on the recipe “Serve warm or cold,” made me laugh. There’s zero chance that this fantastic appetizer could be served cold. Go ahead and try taking a crispy loaf of Bloomin’ Onion Bread out of the oven and see how long it lasts. Chances are good that it will be devoured before the green onions can finish their descent on the oozing cheese. It’s so good that it disappears right before your eyes – a sure sign of a winning recipe! 2. Cut the bread lengthwise in rows about one-inch apart without cutting through the bottom. Turn the bread and repeat to create a grid-like pattern. This can be challenging, but just hold the bread together with your other hand as you slice across your first cuts. 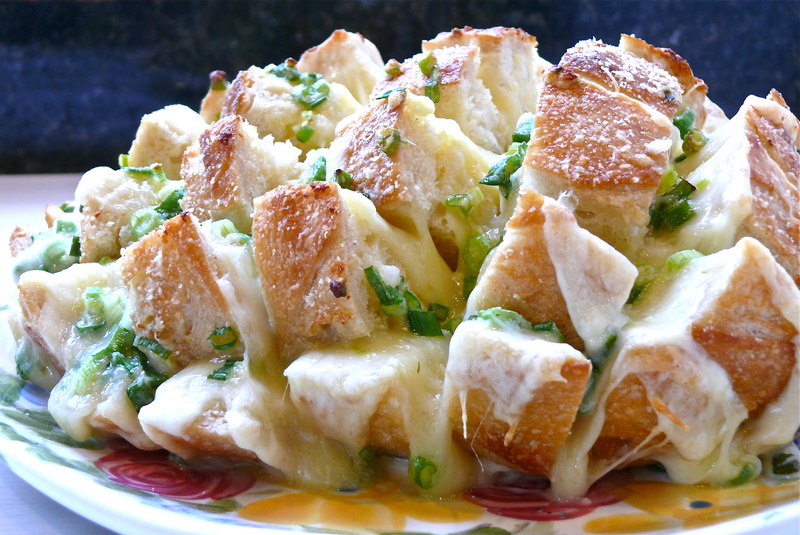 You should end up with little cubes of bread still attached to the bottom. 3. Place loaf on a parchment-lined baking sheet. 4. Insert cheese slices between the cuts of bread. Fill in the spaces as much as possible. 4. Combine melted butter, green onions, garlic powder and Parmesan cheese. 5. Pour evenly over bread. 6. Cover the bread with foil and bake for 15 minutes first. Uncover the bread and bake 10 minutes longer. 7. Serve warm or cold. 1. For best results use a good quality, rustic, sourdough round. 2. I used at least 16 ounces of sliced cheese. I stacked the slices and then cut them into 6ths. I put two slices in between each cut, starting at one end and working to the opposite end. I then turned the loaf around and put 2 slices in each cut going crosswise. 3. Instead of pouring the butter-onion-cheese mixture over the loaf, I spooned it into the crevices around each cube for better distribution. 4. I sprinkled a light dusting of Parmesan cheese over the loaf before putting it in the oven. 5. This recipe is very versatile. Experiment with cheeses or toppings. What about sprinkling bacon bits over it? What about using brie? Have fun and let your imagination go wild!